Last year, Motorola introduced a new ‘M’ series of smartphones with the Moto M that was a brilliant looking phone with good features. One of the highlights of this phone was its full metal design that was very different from the Moto G4 Plus launched at the same price as of the Moto M. Now, this year, it is expected that the company will announce the Moto M2 i.e the successor of the Moto M of 2016. 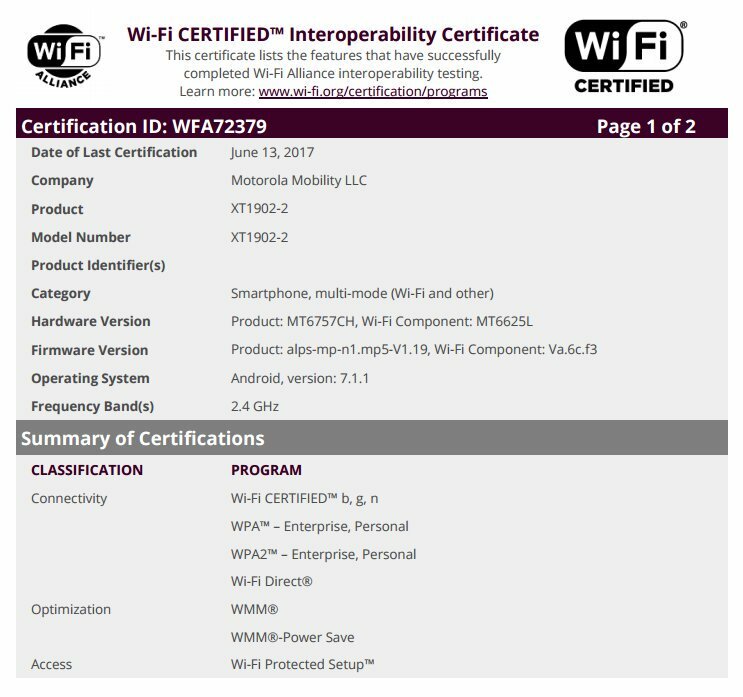 Today, a mysterious Motorola device has got WiFi Certification and it could be the M2. We are not 100% sure that it is indeed the M2, but looking at the processor, it seems like if it is either a Lenovo device or an M series phone from Motorola. As per the certifications, the phone has Android 7.1.1 Nougat running out of the box and it is powered by a MediaTek Helio P20 chipset (MT6757). It is a chip that is manufactured via the 16nm FinFET technology which is the same technology used for the Helio P25. Since we know that the P20 is not a chipset for Dual cameras so we can expect that the Moto M2 ( or Motorola XT1902-2) will come with a single camera on the back. As mentioned above, we are not sure about the name of the device so let’s assume that it is the Moto M2. What do you think about the processor? If it turns out to be the M2, what should be the price of the phone? Do let us know via the comments section.